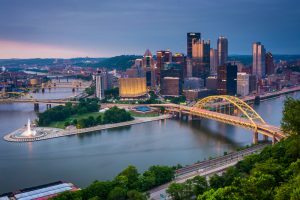 Pittsburgh, which hopes to eventually develop a grid of microgrids, continues to evolve as a center of energy innovation with about 20 distributed energy, nanogrid and microgrid projects now emerging in the Pennsylvania city. “We identified promising sites in different parts of the city — neighborhoods, college campuses, commercial and industrial parks, greenfield or brownfield sites, etc. Some are big and ambitious, others are smaller in scale and more modest in ambition. But they all would potentially benefit from taking a microgrid or district energy approach, and we’re moving forward with all of them,” said Gregg Reed, director of the University of Pittsburgh’s Center for Energy and Energy GRID Institute. The demonstration projects are part of a broader, strategic plan laid out by Pittsburgh Mayor William Peduto to enhance energy resiliency and reliability while reducing greenhouse gas emissions. Some of the projects are up and running, but the majority are in the planning and feasibility assessment phases. Meanwhile, the city is seeing its innovation spread beyond state borders and attract international partners. The Center for Energy and town leaders in Melville have installed a solar-plus-storage nanogrid with what Reed described as “a pretty advanced DC distribution infrastructure.” That extends from an integrated, 30 kW of solar photovoltaics (PV) and 50 kWh of battery-based energy storage all the way to wall outlets inside buildings. Plans are to scale up the nanogrid to the point where it can serve as a community microgrid for the downtown Melville town center area. In addition, the university center is collaborating with regional trucking company Pitt Ohio Express on projects that extend beyond city and state borders. “They have maybe a couple dozen trucking distribution (or logistics) facilities that serve states across the Mid-Atlantic region. Their CEO is very forward looking and sustainability-oriented. They’ve put a lot of effort into better managing energy use and their sustainability footprint,” Reed said. Working together, the university center and the company have implemented a DC microgrid at one of Pitt Ohio’s trucking logistics centers outside of Pittsburgh. If all goes well, they plan to deploy similar microgrids at other logistics centers. At present, the microgrid incorporates a 50-kW solar PV system, 5 kW of wind power and 70 kWh of battery-based energy storage. A second project is being built at a Pitt Ohio Express trucking logistics center outside of Cleveland, Ohio. Reed also is working with colleagues, students and University of Pittsburgh administrators to design and obtain funding for a campus-wide microgrid. Pitt’s main campus spans 132 acres in west Pittsburgh’s historic Oakland neighborhood. The university campus microgrid would serve the University of Pittsburgh Medical Center facilities on campus. Preliminary, feasibility plans call for building a 30-MW microgrid, but that may change as the feasibility study progresses. Pittsburgh’s two utilities are exploring microgrids, district energy and distributed energy resources, projects that also involve Reed and colleagues. For example, Duquesne Light plans to build a 3-MW microgrid at the utility’s Woods Run campus, home to its operations and engineering centers and training facilities. “There are about six buildings on the campus,” Reed said. Natural gas would be the primary fuel for power generation, but the project team is looking to incorporate some wind and solar power, as well. Battery energy storage and integration of existing back-up, diesel-fueled generators would be added in a second phase. A city-scale grid of microgrids has yet to be built. Still more theory than practice, it would be made up of multiple microgrids that at any given time could either operate autonomously or cluster and interact to achieve greater energy efficiency, security, reliability or resilience. During a power outage in any one of the overarching network’s branches, each microgrid could disconnect from the network to protect its system and keep power flowing to its own customers. To realize the grid of microgrids, Pittsburgh needs to surmount several barriers, among them: existing law and regulation that limits on who can own and operate microgrids; inadequate rate structures; and a lack of clear economic models. Securing utility support and participation serves as another potential obstacle. It’s also unclear where upfront capital will come from for research, testing and development of the grid of microgrids. Pittsburgh’s sustainable energy and microgrid development efforts took on an international aspect recently when Reed joined Mayor Peduto and Denmark’s US ambassador Lars Gert Lose in signing a strategic partnership agreement between the university, the city and the Danish Energy Agency. As per the agreement, the Danish Energy Agency will develop workshops for regional entities from the public and private sectors. It will also organize educational exchange trips to Denmark so that stakeholders can explore and learn about distributed energy initiatives in Denmark. The university will provide faculty expertise through its Center for Energy, housed in the Swanson School of Engineering, and the Energy Grid Research and Infrastructure Development (GRID) Institute. Pitt will also provide the socioeconomic expertise to build a data-driven model of robust energy infrastructure pathways for the city. “Not only will this partnership help to cement Pitt’s work in district energy and microgrids, it will also afford us the opportunity to attract further investment towards projects in the city itself, which is needed for deploying more resilient, clean and intelligent energy infrastructures,” Reed said. Reed pointed out that Pittsburgh is home to several, well-funded philanthropic organizations, such as the Andrew W. Mellon Foundation, as well as colleges, universities and the corporate headquarters or major offices of national and international corporations, among them former Westinghouse group companies Eaton and Emerson. The university center is working with a growing number of them to advance the city and university’s grid of microgrids and sustainable city-energy plans. Reed mentioned the microgrid project in development at Pittsburgh’s International Airport as an example of the growing awareness, knowledge and active participation of city businesses, institutions and communities in realizing the city’s sustainable city-energy plans. “I think we’re providing a lot of leadership not only locally in the community, region and state, and we’re trying to become a global leader when it comes to building the green, intelligent grid of the future,” Reed said. That not only encompasses the various technological facets and elements associated with grid modernization, but the evolution of green energy development methods and local clean-tech supply chains. 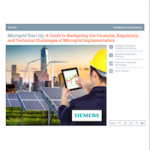 Interested in the grid of microgrids concept? 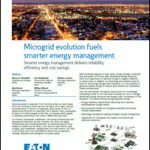 Read more by subscribing to the Microgrid Knowledge newsletter. It’s free. I believe you mean Millvale vice Melville in the 5th paragraph.